Water quality takes center stage in the Conservation Chat podcast’s long-awaited return! The Chat debuts its new format, featuring multiple guests on the program together for a roundtable-type discussion. In the newest episode, Improving Water Quality, host Jacqueline Comito visits with two rockstars on Iowa State University’s water quality scene, Matt Helmers and Jamie Benning. Tune in to this latest episode for an engaging discussion on timely topics related to water quality and agricultural production here in the state of Iowa, centered around the Iowa Nutrient Reduction Strategy. Having been released five-plus years ago, Comito, Helmers, and Benning discuss the progress made thus far, but also the immense scale of implementation needed to achieve tangible progress in terms of nutrient reduction and improved water quality. Tune in as they bounce ideas about the interwoven relationships between dollars spent, practices implemented, nutrients reduced, policy structure, and progress towards true paradigm shift. In addition, Helmers and Benning both emphasize the importance of translating pure scientific research to more accessible, digestible outreach materials for general public consumption through such means as short videos, webinars, field days, and infographics. Helmers shares a great anecdote about the power of video to reach broad audiences around the world – he is currently hosting a student intern from Honduras, and this student had recently seen the Iowa Learning Farms’ Rainfall Simulator video in one of her engineering classes back at her home institution! Tune in to Episode 40 of the Conservation Chat to hear the full interview with Matt Helmers and Jamie Benning. You can also download or listen to any of the previous podcast episodes on the Conservation Chat website and through iTunes. How can doing less earn you more? 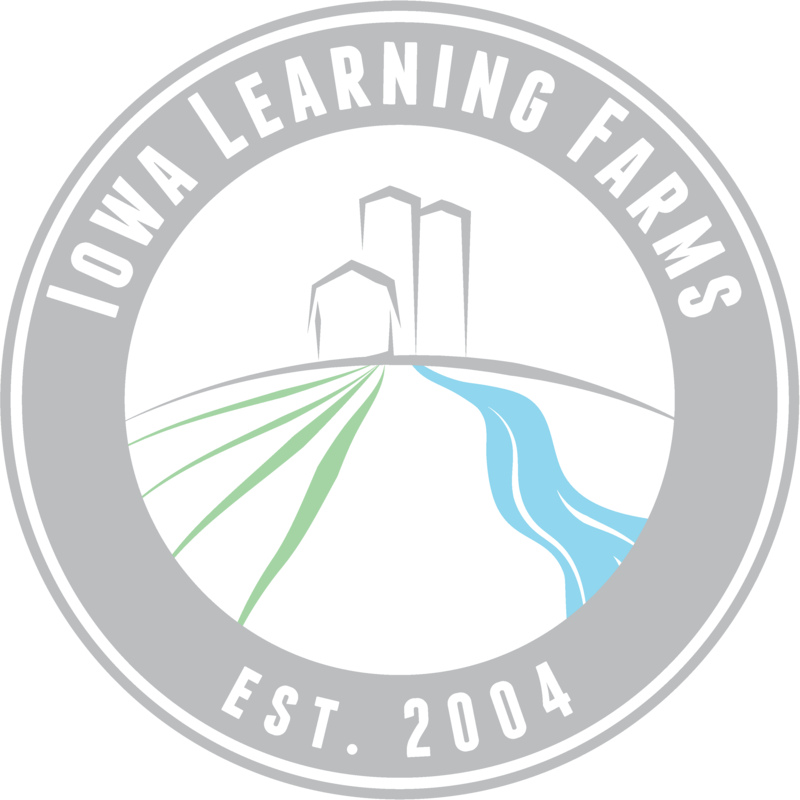 Mark Licht discussed how you can do just that by making the transition to no-till soybean and adding a cover crop ahead of soybeans during our Iowa Learning Farms webinar yesterday. Compared to conventional systems with a fall and spring tillage pass, no-till can lower input costs by about $30, while also saving the time not running the equipment. By lowering input costs overall profit per acre can be increased by nearly 17%, according to a 10 year research study at seven ISU research farms. No-till can also significantly reduce soil erosion and phosphorus loss, compared to chisel plowing. That same 10 year study, showed a 90% reduction in phosphorus loss. Cover crops also help reduce soil erosion and phosphorus loss, while also reducing nitrogen losses from the landscape. 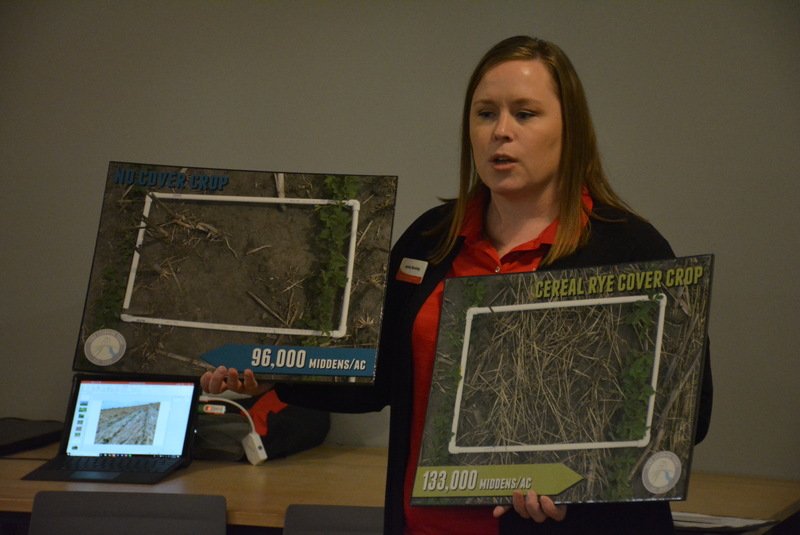 Mark noted that cover crops are an easy entry point for farmers and landowners to voluntarily help meet the Iowa Nutrient Reduction Strategy goals. If 75% of Iowa soybean acres were seeded to a cover crops, we would reach 60% of our nutrient reduction goal! According to a nine year study by the Iowa Learning Farms and Practical Farmers of Iowa, the long-term use of winter cereal rye shows no yield impact on soybeans in most years. In fact, for eight sites there was an average 8 bu/ac increase following cereal rye. If you’re curious on how to make the transition to #notillb4beans and #coveryourbeans, be sure to tune in to the full webinar here as Mark provides tips for making it work for you. Be sure to join us in this campaign and share your stories and pictures using the #notillb4beans and #coveryourbeans hashtags! Late last month, farm advisors, consultants, agronomists and farmers gathered for the 30th annual Integrated Crop Management Conference. Over these years, participants have been able to choose from well over 100 sessions on the latest research and recommendations for soil management and water quality from the field to watershed scale. Since the Iowa Nutrient Reduction Strategy (INRS) was introduced in 2013, there have been additional sessions focused on reducing nitrate-nitrogen (N) and phosphorus (P) loss. This year, Matt Helmers, Mark Licht and I led two interactive sessions with about 60 participants each with the objectives of reinforcing the goals of the NRS, discussing specific practices and their costs and effectiveness, and encouraging dialogue and deeper thinking about the challenges to meeting these goals. We used an online tool called Kahoot and participants responded to each question anonymously using their smartphones. The groups did a great job identifying the major sources of nitrate-N and P loss from agricultural systems and selecting practices that will most effectively reduce loss within the field and at the edge of field. This is positive feedback for ISU Extension, Iowa Learning Farms, and many other agriculture and conservation organizations that have developed and delivered outreach and professional development opportunities for this audience over the past five years. Understanding and ranking cost effectiveness was a bit more challenging for the group, indicating that we need to double down on our outreach and education on recent research and scenarios to better reinforce this information as it is critical for decision-making. Farmers and landowners are not feeling a sense of urgency to install these practices. I was very surprised that 38% of both groups selected the lack of a sense of urgency as the top barrier to adoption. The costs of practice installation came in nearly tied with 33% selecting it as the top barrier. In discussions with similar groups and with conservation colleagues, I hear the cost limitations much more frequently, especially in the past few years of low commodity prices, along with the other two choices. In response to the other three barriers, significant outreach and incentive programs have been developed and modified to address these concerns. Farmers’ sense of urgency is rarely discussed. The response to this question caused me to reflect on how our outreach programs may be influencing this lack of urgency. Leaders agree that we have measured increases in funding and technical assistance, the number of learning opportunities available to farmers, landowners and stakeholders, acres of implemented practices and many other indicators of progress but that we have a huge amount of work yet to do to reduce the size of the hypoxic zone. The Hypoxia Task Force has set an interim goal of a 20% load reduction in both nitrate-N and P by 2025 and a 45% reduction by 2035. My goal for the New Year is to bring the timelines front and center to convey that the INRS, while voluntary, is not optional and we need to increase our efforts. I also want to illustrate the relationship between reducing the size of the Gulf Hypoxic Zone and local drinking water quality protection, better habitat and quality of life that result from cleaner rivers and lakes, and the economic development opportunities for small businesses that design and install conservation practices, grow and sell cover crop seed, and beginning farmers seeking to grow their pasture-based livestock operations. As you reflect on the 2018 growing season and think about goals for next year, I challenge you to set at least one goal related to improving the water quality leaving your farm. To increase the chances that you will achieve this goal, write it down and talk to someone about it! To demonstrate to the public that the voluntary system can work, acres of cover crops, numbers of wetlands, bioreactors, and saturated buffers, acres of no-till and many other practices all need to increase sharply over the next few years. Making one of the commitments I listed or setting your own unique water quality goal will lead to water quality improvement and may make your farm more profitable in the process. As the weather gets colder and the days grow shorter, evening cover crop field days move indoors. Fortunately, the indoor atmosphere was perfect for an informal cover crop discussion. The Nick Meier Field Day was hosted at Single Speed Brewery in Waterloo where attendees enjoyed several different varieties of flat bread pizza made from local ingredients. After dinner, the conversations turned toward cover crops, crop insurance, herbicide planning, soil health, earthworms and water sampling. The evening concluded with an excellent farmer panel where they discussed their experience using cover crops, planting into cover crops and tips for termination. The field day was hosted by Practical Farmers of Iowa, the Iowa Farmers Union, the Soil Health Partnership, the Iowa Seed Association, the Department of Agriculture and Land Stewardship Clean Water Initiative, Iowa Corn, Iowa Soybean Association and the Iowa Agriculture Water Alliance and Iowa Learning Farms. 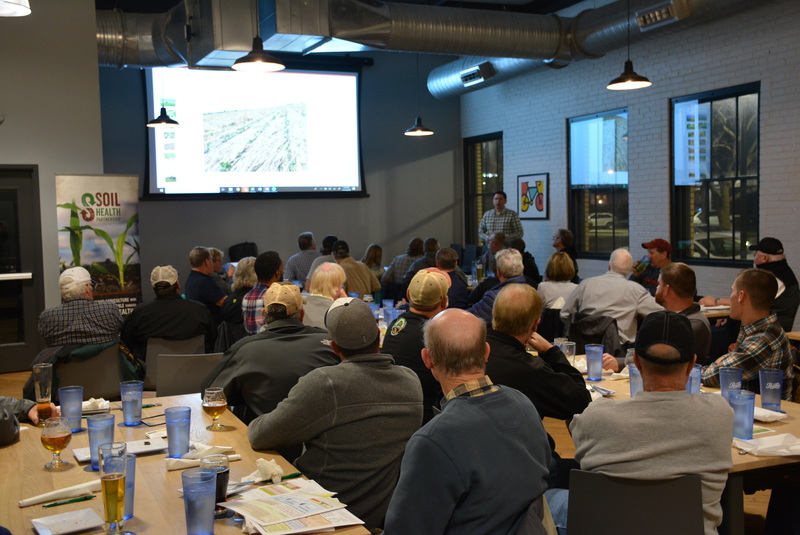 If you missed the field day and are interested in attending one this month, visit our events page to find one near you and RSVP today!